This Iowa permit test, with multiple choice questions, is intended to help you prepare for the Iowa written knowledge test that is required before you can get your driver’s license. Passing the Iowa permit test is as easy as 1 2 3 using our online interactive Iowa Test Practice with high quality images. Study for this driver’s license practice test is completely free. Anyone who operates a motor vehicle or motorcycle or moped on public streets and roads in Iowa is required to have a license. The knowledge test shows how well you know and understand highway signs and Iowa traffic laws. If you’re 14, congrats! Here, it all begins. In your local Iowa DOT office, you can apply for a Learner’s Permit, which allows you to be on the road with a parent or legal guardian after taking a vision and theoretical exam. You also get to participate in Driver’s Education classes, a must before the next step. 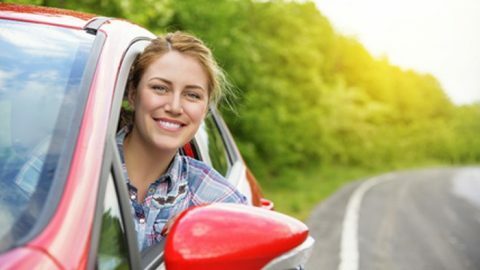 After having driven for one full year on your learner’s permit with supervision, having completed a Driver’s Ed course and having a clean record, you’ll be able to apply for the Provisional License. This license allows you to drive without supervision between the hours of 5:00 am and 12:30 am, while supervision is still required the other 4 1/2 hours. The earliest you can apply for the provisional license is at 16 years of age. But of course, you want to get rid of these restrictions! If you’re at least 17 years old, have driven on a provisional license for at least 12 months without accident and have parental approval, you get to apply for the full license. Now, you’re free to be on the roads at your own convenience. Did you notice something when we went through those steps? The most difficult part, sticking out like a sore thumb, is the theoretical exam to get your learner’s permit. And that’s where we come in. With our seven practice tests, focusing specifically on traffic laws and road signs within the state of Iowa, you’ll be ideally prepared for the test, and everything else that follows! Contact us today for more help on driving the Iowa roads.